At least 141 people are now known to have died in floods and landslides triggered by torrential rain in western Japan as rescuers are digging through mud and rubble in a race to find survivors, with dozens missing. 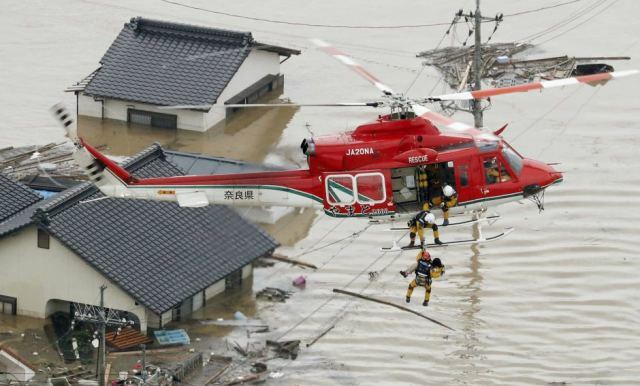 It is the highest death toll caused by rainfall that Japan has seen in more than three decades. More than 70,000 rescue workers, including the fire service and the Army, were involved in the relief effort, the government said on Tuesday. About two million people were evacuated from the region after rivers burst their banks. The rains started on July 5, the BBC reported. Authorities opened up school halls and gymnasiums to those displaced by the rainfall. There remained a risk of landslides, with rain-sodden hilltops liable to collapse. Prime Minister Shinzo Abe cancelled an overseas trip to deal with the flood crisis. “We will unite and move swiftly to deliver those necessities to the disaster victims by coordinating closely with local government,” said Abe in a meeting with the disaster response task force. Flood warnings were still in effect for some of the worst-hit areas, including the Okayama prefecture in the southern part of Japan. But more settled weather was expected over the next few days which will likely help with rescue efforts. Police, fire departments and the military were scouring affected areas for those unaccounted for, reports said.